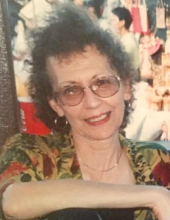 Judith “Jody” Hanson passed away peacefully on Tuesday evening, February 5th 2019 at 79 years old at New Horizons Adult Care. She grew up in St. James, Minnesota and was primarily an art teacher most of her life, although she also managed motels with her husband Ray for approximately a decade in California, before returning back to the US Trust Territory of Guam where she retired as a librarian for the elementary school system there. She and her husband met in Minnesota at Mankato State, on a blind date and married a year later, despite Jody reporting her first impression of Ray was that he was somewhat of a braggart, and appeared a ladies’ man. Ray insists Jody was attracted to his unique sense of style: he has always claimed he was the first man at the college to wear flesh colored glasses and carry a backpack on campus, introducing a fashion craze that other students quickly copied. Our family members all agree Ray must have married my mother for her sweet disposition, adventurous spirit, and sense of humor— and definitely not for her cooking skills or joy of housekeeping. During the late 1960’s, the couple moved with their two daughters to Guam, providing the family with the unique opportunity to travel the South Pacific and Japan. The Hanson family spent one exciting summer in Taiwan: one special night they invited the local hotel staff into their room to watch Neil Armstrong walk on the moon on their fuzzy black and white TV. Another time they spent a fun filled week in the Philippines, when it got hit by a super typhoon. Their most memorable times as a family, however, were living in Guam during part of the Vietnam era. They had the opportunity to become friends with many of the soldiers stationed there for R & R during the war. This experience moved them, along with the hippie movement— and to their children’s horror— both Ray and Jody got their hair permed into afros. They also appeared to become attached to purple tie dye clothing; luckily this phase did not last as long as the war. Over the last decade they enjoyed retirement life in Arizona, collecting a whole lot of stuff, and allowing their packrat tendencies to run free. Jody particularly enjoyed collecting vacuums and anything wicker. In 2017, once Ray had filled the garage completely, he passed away, leaving a whole lot more stuff. Upset with his sudden passing, Jody would call her daughter often to complain saying: “I knew he would die first, quick and easy, while I linger, leaving me with a whole bunch of his *#** to deal with.” Her daughter, not feeling very empathetic at this point responded by saying: “How do you think I feel: that’s my inheritance?” The Hanson and Lundgren family want to thank the staff of New Horizons Adult Care (especially Martha Forbes) for all the support they provided to Jody, treating her like a queen the last year and a half. Somehow the staff had the courage to provide her with a bell that she was allowed to ring day and night, whenever she needed anything. She would repeatedly tell everyone: “I’m not going to feel guilty for being served. I deserve it after all these years.” In addition, I would like to thank Maggie’s Hospice for endlessly being there for her through tears and laughter. Her nurse, Jessica Klein, was always attune to her multiple medical issues and Pastor Beth tirelessly helped her through her most trying times spiritually . Once again thanks so much to all at the home and hospice who were there steady and consistent until Jody’s last breath. Special thanks to Libbie Achenstein, for all her support and extraordinary timing when she was needed. She is survived by her daughters, Kimberly Lundgren and Dawn Hanson; brother, Jay Schleier and spouse, Susie; nephew, Jerome Schleier, and spouse, Savannah; son-in-law, Dan Lundgren; niece, Lori Hesli and spouse, Rick; nephews,Todd Lauck and spouse, Sue, Scott Englin and spouse, Cathy; step- grandchildren, Vanessa Kinyon and spouse, Adam, Nicole Lundgren;great-grandkids, Gretchen, Hazel, Jacoby and Beckett. To send flowers or a remembrance gift to the family of Judith Jean Hanson, please visit our Tribute Store. "Email Address" would like to share the life celebration of Judith Jean Hanson. Click on the "link" to go to share a favorite memory or leave a condolence message for the family.